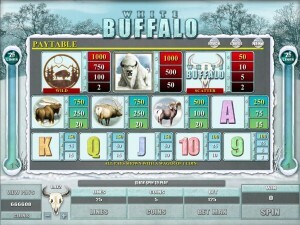 Microgaming is the developer behind White Buffalo. 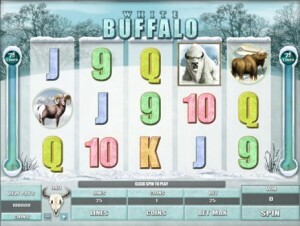 The slot machine is indeed themed around the very rare white buffalo, but that’s not the only herbivore that has found its way unto the reels of this game. The game comes with a winter setting, the snow covered landscape being visible behind the reels. As far as I know this is the only slot which uses this majestic creature as inspiration. A modern game with a theme that focuses on nature, it has 25 paylines and 5 columns. 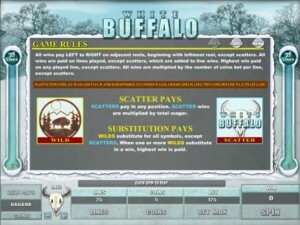 The free spins are part of the list of features, along with the scatter symbol and the wild. It will reward you with up to $6,000 in prizes. 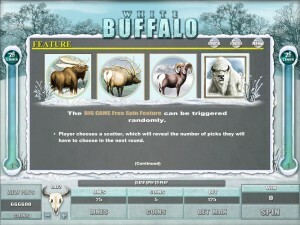 You will discover in White Buffalo a game which relies on wild symbols, on scatters and a bonus feature which decides the number of free spins that you can get. The wild symbol is first on the list of symbols to look out for, both because it pays very well and because it is used as a wild. It will substitute for pretty much any symbol, the one exception being the White Buffalo Logo, which is used as a scatter. Other than that, if it lands where it’s needed, it will take any role it has to. The wild is also quite capable of creating combos directly, by having multiple wilds arranged from left to right. The prizes reach 1,000x the line wager if that happens. 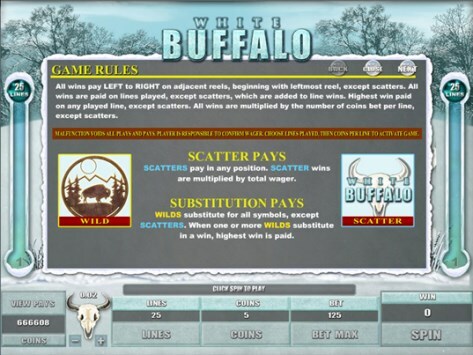 The White Buffalo Logo scatter symbol also pays well enough, but it doesn’t need the symbols to be on a certain line or in fixed positions on it. The symbols can be anywhere on the five reels, as long as there are between two and five of them, which will pay you between 2x and 50x the triggering bet. The free spins get started at random, so they’re not activated by the scatter symbol, like it’s usually the case in modern slots. 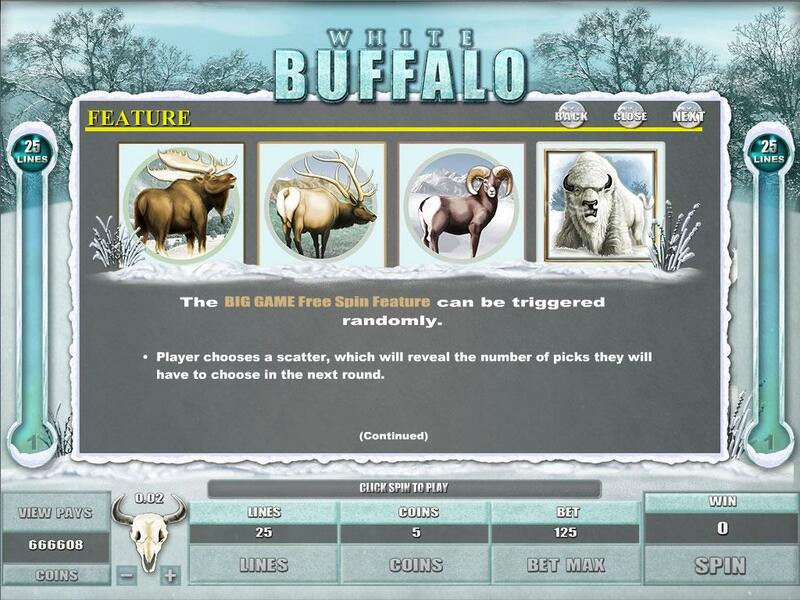 You get a choice on the next screen, between the four big game animals (white buffalo, reindeer, goat and moose). Your choice will reveal how many free spins you’ve won. If you retrigger this feature, you will get an additional 6 free spins from it. It can be an expensive game, with relatively low rewards. It asks for up to 30 coins to be used on a single line, or up to 750 coins total. The value of one coin reaches a top value of $0.20, so you can expect $6 line bets and $150 total bets at the maximum level. 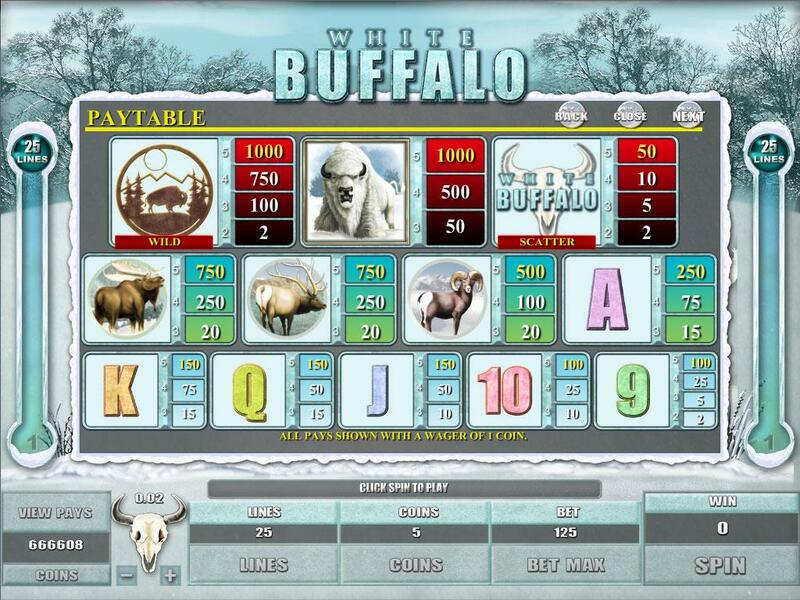 A 1,000x top jackpot is far from impressive these days, but that’s what you’re offered in White Buffalo. You will get 30,000 coins from it, but only $6,000 cash. The game manages to look pretty good whenever wildlife is celebrated on its reels, with four different big game animals being among its symbols. The background image is another plus in its favor, a winter landscape where snow covers everything and with a couple of naked trees. The problem would be with the playing cards, which seem to take over the reels most of the time, since they’re lower paying icons and tend to be the ones that show up more often. They’re not themed at all, just colored differently. Symbols: Buffalo Drawing (wild, 1,000x), White Buffalo Logo (scatter, 50x the bet), White Buffalo (1,000x), Moose (750x), Reindeer (750x), Mountain Goat (500x), Ace (250x), King (150x), Queen (150x), Jack (150x), 10 (100x) and 9 (100x). The focus on the White Buffalo is probably unique as far as themes go, but besides a couple of big game symbols there isn’t much here to keep you interested. I’d suggest going for another one. 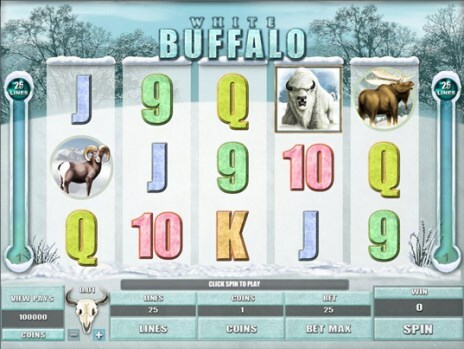 You will find White Buffalo at any online casino which chooses to use software from Microgaming, playable either for free or for real money.